Great! All these items can be created using nested for loops. Below is some code to get you started. Underneath each of the comments, fill in the code required to make the pattern. # Below, replace "pass" with your code for the loop. # Don't loop from 30 to 60 to shift everything over, just add 300 to x. # Use the modulus operator and an if/else statement to select the color. # Don't use multiple 'if' statements. # Use the modulus operator and just one 'if' statement to select the color. # Do NOT use 'if' statements to complete 5-8. Manipulate the loops instead. Each little square is a 5x5 pixel square. 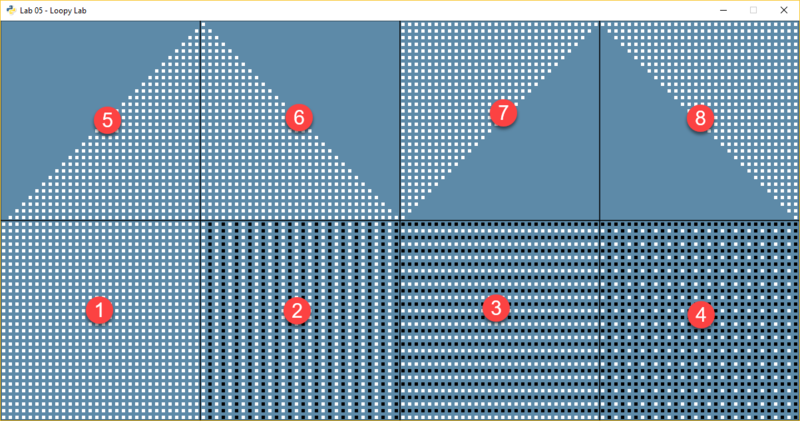 If the center of each square is 5 apart, you won’t see an edge and it will look like one big square. Remember, row controls up and down, so it corresponds to y. Column corresponds to x. When working on sections 2-8, you can simple add to the x and/or y values to shift everything over. For example, just add 300 to all the x values in section 2, to put it in the second box. Each section is 300x300 pixels. You will only need two for loops. Do not use a third nested for loop. Section 4 only needs one if statement. The trick is to use an and. You can count “backwards” by subtracting.